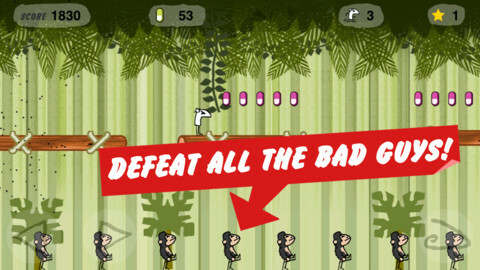 Sensei Games today announced that the smash hit game Sneezeman:Escape from Planet Sneeze, based upon the cult TV cartoon character Sneezeman, has been updated with new features and a FREE version for iOS devices (iPhone, iPad and iPod touch). Set in the Sneezeman universe, and with exclusive artwork from the characterâs creators Modern Toss, Sneezeman:Escape from Planet Sneeze is an arcade style platform game in which the hapless hero is chased across levels by a relentless sneeze cloud thatâs intent upon setting off a chain of catastrophic sneezing. Players must guide Sneezeman across up to 5 themed worlds and over 60 levels (new worlds and levels coming in updates next year, 4 Worlds and 48 levels in FREE) whilst avoiding a wide array of enemies including zombies, evil clowns, ghosts, rats, aliens, and robots. The object of the game is to help Sneezeman collect pills that will help control his sneezing and enable him to make it to the level exit in the best possible time, for the top score you will also need all 3 stars contained in each level. In addition to running, jumping and bashing their way across levels, players will also need to help Sneezeman master a variety of transportation modes including handkerchief parachutes, a car and other vehicles such as the motorbike, dodgem car and even a hearse! 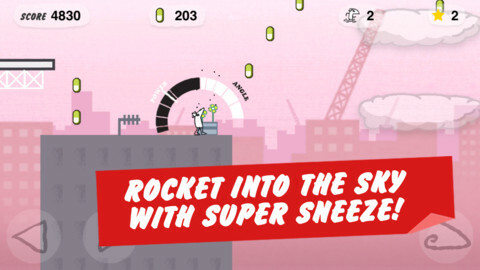 Sneezeman:Escape from Planet Sneeze will be very familiar to fans of the cartoon series âModern Tossâ that has been broadcast in over 30 countries, in which Sneezeman causes a series of chaotic incidents when he begins sneezing. To new players, Sneezeman will provide a huge amount of gameplay, with developers Sensei already planning to release free updates that will add extra features and gameplay.